Gordon Brown - A Professional Image? Somehow I've found my way onto a New Labour mailing list. I keep meaning to unsubscribe, but don't as occasionally they send little gems like this, received on wednesday. 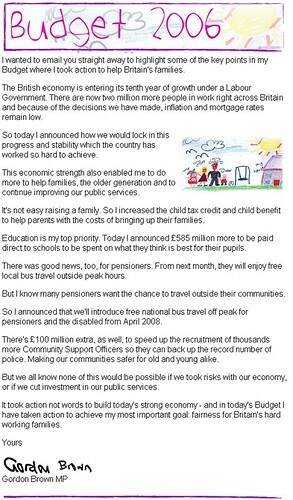 A post-budget missive purporting to be from Gordon Brown, complete with drawings made in crayon. I don't know about you, but the general impression I get from this is very (ahem) professional. The missive from Menzies Campbell was much more effective, simple and elegant graphics, well laid out (I'll screencapture if anyone is desperate to see it). I have yet to find my way onto a Tory mailing list, so don't know what the wonderchild has had to say on the matter of the budget.